Mutations in the BRCA1 and BRCA2 genes are responsible for only a part of hereditary breast cancer (HBC). The origins of "non-BRCA" HBC in families may be attributed in part to rare mutations in genes conferring moderate risk, such as CHEK2, which encodes for an upstream regulator of BRCA1. Previous studies have demonstrated an association between CHEK2 founder mutations and non-BRCA HBC. However, very few data on the entire coding sequence of this gene are available. We investigated the contribution of CHEK2 mutations to non-BRCA HBC by direct sequencing of its whole coding sequence in 507 non-BRCA HBC cases and 513 controls. We observed 16 mutations in cases and 4 in controls, including 9 missense variants of uncertain consequence. Using both in silico tools and an in vitro kinase activity test, the majority of the variants were found likely to be deleterious for protein function. One variant present in both cases and controls was proposed to be neutral. Removing this variant from the pool of potentially deleterious variants gave a mutation frequency of 1.48% for cases and 0.29% for controls (P = 0.0040). The odds ratio of breast cancer in the presence of a deleterious CHEK2 mutation was 5.18. Our work indicates that a variety of deleterious CHEK2 alleles make an appreciable contribution to breast cancer susceptibility, and their identification could help in the clinical management of patients carrying a CHEK2 mutation. Breast cancer is one of the main causes of cancer-related deaths among women worldwide, with 5% to 10% of cases being due to hereditary risk. However, mutations in the two major genes, BRCA1 and BRCA2, are found in only 15% to 20% of hereditary breast cancer (HBC) families . Several studies have reported evidence that germline mutations in other susceptibility genes, such as ATM, PABL2, BRIP1 and CHEK2, might be the predisposing factor in some HBC families [2–5]. In addition, the lower penetrance of these mutations suggests that they might act in concert with other hereditary factors [6–10]. CHEK2 is the human homolog of Rad53 (Saccharomyces cerevisiae) and Cds1 (Schizosaccharomyces pombe). This family of kinases is characterized by several domains: a SQ/TQ cluster domain, a Forkhead-associated (FHA) domain and a Ser/Thr kinase domain . In response to DNA double-strand breaks or replicative stress, CHEK2 is activated by the kinases ATM and ATR . These proteins catalyze the phosphorylation of threonine 68 of CHEK2, causing its transient dimerization via the FHA domain. This leads to CHEK2 trans-autophosphorylation and its full activation . Activated CHEK2 monomers phosphorylate, in turn, numerous downstream substrates, including the P53 tumor suppressor, CDC25 family proteins and serine 988 of BRCA1, activating cell-cycle checkpoints and increasing DNA repair efficiency [14–17]. These interactions suggest that CHEK2 may also play a role in breast cancer . Germline CHEK2 mutations are associated with breast cancer in different populations. For example, heterozygosity for the well-studied c.1100delC mutation, present in 1.4% of the Finnish population and in 0.2% of the Polish population, confers a relative risk for developing breast tumors of about 2 for women and 10 for men [18, 19] Likewise, the variant Ile157Thr, present in 5.3% of the Finnish population and in 4.8% of the Polish population, confers a relative risk of breast cancer of 1.5 [20, 21]. However, very few groups have studied the entire CHEK2 gene in HBC [22–25]. It is essential to establish a causal link between sequence variants and CHEK2 function. Little is known about the impact of missense mutations on protein function, although substitutions in the FHA domain and the kinase domain have been shown to abolish activity [22, 26, 27]. In this study, we screened the whole CHEK2 coding sequence for mutations in non-BRCA HBC families and a control population without any family history of breast cancer. Point mutations were evaluated by in silico analyses and an in vitro kinase activity test. We recruited 507 cases with HBC risk through the oncogenetic consultation department at the Centre Jean Perrin (Clermont-Ferrand, France). This group consisted of 258 families with 3 breast cancers in the same familial branch with at least 2 cases related in the first degree, 237 families with 2 cases of breast cancer in the same branch with at least 1 breast cancer diagnosed before age 40 years or with bilateral breast cancer, and 12 families with 2 cases of breast cancer and at least 1 male breast cancer. One affected patient per HBC family was screened for variants in CHEK2. Cases with HBC linked to BRCA1 or BRCA2 mutations were excluded by direct sequencing of both genes and by multiplex ligation-dependent probe amplification of BRCA1. A control group recruited from the same region of France consisted of 513 female volunteers in good health and without any personal or family history of breast or gynecologic cancers at the time of the recruitment. All subjects signed informed consent agreements that were approved by the CCPPRB Regional Ethics Committee (Auvergne, France). To assess the relationship between CHEK2 variants and breast cancer risk, logistic regression was used to obtain odds ratios (as estimates of relative risk) and 95% confidence intervals . To identify variants in the CHEK2 gene, exons 2 to 14 were analyzed (exon 1 is noncoding, and exon 15, representing 89 bp of coding sequence, could not be analyzed for all the patients, owing to the presence of repeated sequences) in both patients and controls for the genomic sequence [GenBank:NG_008150.1] and for the cDNA sequence [GenBank:NM_007194.3]  DNA was extracted from 10 ml of peripheral blood collected on heparin/lithium using a Genomix blood DNA extraction kit according to the manufacturer's instructions (Talent srl, Trieste, Italy). Samples were resuspended with Tris-ethylenediaminetetraacetic acid (EDTA) (TE) (10 mM Tris, 1 mM EDTA, pH 8.0). Exons 2 to 10, including intron-exon boundaries, were amplified by using standard PCR techniques (conditions and primers available on request). Because of the multiple copies of CHEK2 pseudogenes, we used a nested PCR strategy, described previously by Sodha et al. , to specifically amplify exons 10 to 14 . Sequence reactions were performed on PCR products purified by ExoSAP-IT (Affymetrix, Inc, Santa Clara, CA, USA) using BigDye v3 reagents (Applied Biosystems/Life Technologies, Foster City, CA, USA) (primers available on request), purified in Sephadex G-50 fine (G5080; Sigma-Aldrich, St Louis, MO, USA) and analyzed using a 3130xl capillary electrophoresis system (Applied Biosystems/Life Technologies). Alignment to the reference sequences was performed using SeqMan NGen software (DNASTAR, Inc, Madison, WI, USA). For each missense variant, prediction of the impact of the mutation on the protein was assessed by calculating the SIFT (Sorting Intolerant From Tolerant), Align-GVGD and PolyPhen-2 (Polymorphism Phenotyping v2) software tool scores [31–34]. Align-GVGD predictions and SIFT score were computed using the ortholog alignment of exons 2 to 14 of CHEK2 derived by using Alamut software (Interactive Biosoftware, Rouen, France) . Included were human (Homo sapiens) [GenBank:NP_009125.1], chimpanzee (Pan troglodytes) [GenBank:XP_001172759.1], macaque (Macaca) [GenBank:XP_001101658.1], rat (Rattus norvegicus) [GenBank:NP_446129.1], mouse (Mus musculus) [GenBank:NP_057890.1], dog (Canis lupus familiaris) [GenBank:XP_543464.2], cow (Bos taurus) [GenBank:NP_001029703.1], chicken (Gallus gallus) [GenBank:XP_001232074.1], frog (Xenopus tropicalis) [GenBank:NP_001119996.1] and pufferfish (Tetraodon nigroviridis) [UniProtKB/TrEMBL:Q4TI84], all extracted from the Ensembl Compara database . PolyPhen-2 score was calculated online using default settings and accession numbers [UniProtKB/Swiss-Prot:O96017] [36, 37]. The potential impact on splicing was studied using SpliceSiteFinder, MaxEntScan and GeneSplicer prediction software [38–40]. The pDream2.1 cloning vector (GenScript USA Inc, Piscataway, NJ, USA) carrying the full-length human CHEK2 coding sequence tagged with an N-terminal FLAG extension under the control of the LacZ promoter for expression in prokaryotes was verified to contain the wild-type (WT) sequence. The Stratagene QuickChange II Site-Directed Mutagenesis Kit (Agilent Technologies, Inc, Santa Clara, CA, USA) was used to generate mutant constructs Ser39Phe, Pro85Arg, Arg117Gly, Arg145Trp, Glu161Del, Arg180His, Lys224Glu, Lys244Arg, Met367fsX15, Tyr390Ser and Thr476Met, with the corresponding primers (available on request) in accordance with the manufacturer's recommendations. All constructs were confirmed by sequencing of the entire coding region of the gene (primers available on request). Escherichia coli strain BL21 was transformed with pDream plasmids(GenScript USA Inc) encoding WT or mutated Flag-CHEK2. Cultures were grown at 37°C in Luria Broth media containing 100 μg/ml ampicillin until absorbance at 600 nm reached 0.6 before isopropyl β-D-1-thiogalactopyranoside was added to a final concentration of 0.5 mM and incubated for 3 hours. Extraction of total bacterial proteins was performed as described previously . Omnia kinase assay buffer (18 μl; Invitrogen/Life Technologies, Carlsbad, CA, USA) containing 10 μM Sox substrate peptide, 1 mM ATP, 0.2 mM dithiothreitol and 2 μl of 10 × Omnia buffer was incubated for 5 minutes at room temperature and aliquoted to a 96-well plate to ensure equal amounts of the chemosensor. For each assay reaction, 1.5 μg of total bacterial protein from induced cultures containing WT or mutated Flag-CHEK2 or from untransformed E. coli, were then added and mixed gently. CHEK2 protein was added at the moment of the fluorescence acquisition, allowing us to follow the kinetics of substrate phosphorylation. CHEK2 kinase activity was monitored with excitation at 360 nm and emission at 485 nm. Fluorescence was detected using an Infinite 200 PRO plate reader (Tecan Group Ltd, Männedorf, Switzerland) for 60 minutes at room temperature. For each mutation, an average of six wells and three independent experiments were conducted. Each curve was normalized by linear regression using the slope of the corresponding nontransformed bacterial protein extract curve. Thus the slope of the resulting curves represents the ability of CHEK2 recombinant protein to phosphorylate the substrate (see Additional file 1). To evaluate the contribution of CHEK2 mutations to HBC, we sequenced the coding sequence of the gene, including intron-exon boundaries. We observed 13 different variants in 16 of 507 cases and 4 different variants in 4 of 513 controls (Table 1). In the case population, there were eight different novel missense mutations and one previously described in osteosarcomas , as well as one nonsense mutation, one novel frame shift mutation, one splice donor mutation and three patients (0.59%) with the c.1100delC (Met367fsX13) mutation (Figure 1). No mutation hotspots were observed (Figure 1). Mutations among controls included three missense mutations and one affecting a splice donor site. To the best of our knowledge, we are the first to report all mutations found in the control population. 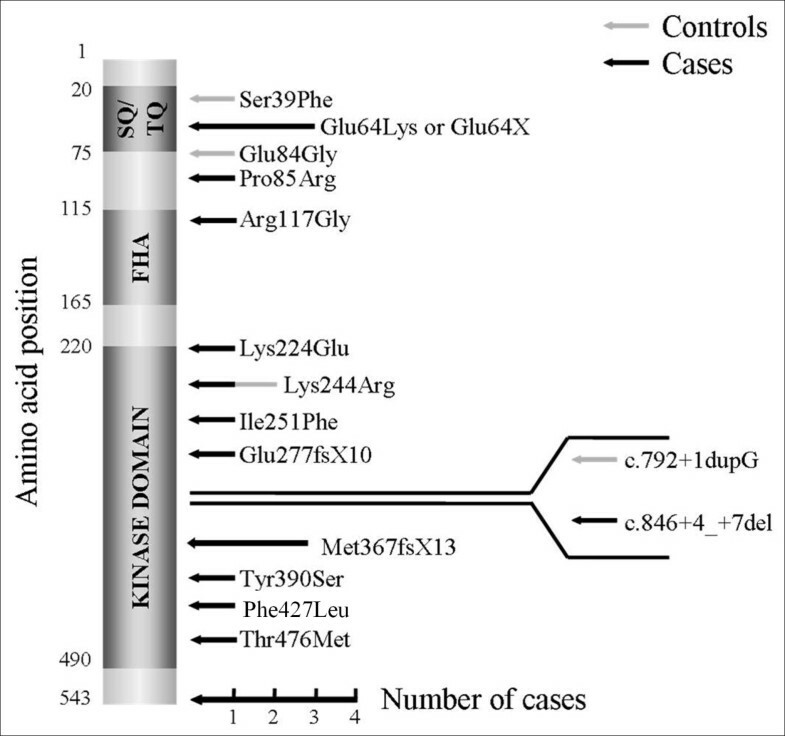 The missense mutation Lys244Arg was found in both cases and controls. The mutation frequency was higher for the cases (16 of 1,014 vs 4 of 1,026; P = 0.0065) (Table 2). The OR of CHEK2 mutation carriers was 4.15 (95% CI = 1.38 to 12.50), suggesting that CHEK2 contributes to hereditary risk of breast cancer. Align-GVGD, SIFT (Sorting Intolerant From Tolerant) and PolyPhen-2 (Polymorphism Phenotyping v2) software tool scores and splicing effect were calculated. The possible impact of the different mutations on CHEK2 function is proposed. FHA = Forkhead-associated domain. Position of CHEK2 mutations found in French non-BRCA HBC and control populations. FHA = Forkhead-associated domain; SQ/TQ = SQ/TQ cluster domain. an indicates the number of alleles. Canonical splice donor and acceptor sites were evaluated using SpliceSiteFinder, MaxEntScan and GeneSplicer. All three programs provided consistent information that the two mutations affecting splice donor sites abrogate splicing of the exons concerned (Table 1). We thus considered these mutations to be deleterious. Because the effect of an amino substitution can be difficult to assess, a combination of three different in silico analyses (Align-GVGD class, SIFT prediction and PolyPhen-2 prediction) was used. For each missense variation, we compiled these three scores to propose a diagnosis. Missense variants were considered probably deleterious if at least one deleterious score was obtained and probably benign if three benign scores were obtained. Class above C35 was considered the threshold for deleterious variants in Align-GVGD. Substitutions with a SIFT score less than 0.05 are predicted to be deleterious. A SIFT median sequence conservation score cutoff of 3.25 was used to measure the diversity of the sequences used for prediction, and a score greater than 3.25 could indicate that the prediction was based on closely related sequences. This would result in a low confidence score if the variant were considered deleterious. No SIFT median sequence conservation score reached this cutoff, indicating that the aligned sequences were diverse enough for confident prediction of substitutions that should affect protein function. One mutation, Lys244Arg, present in both cases and controls, was not considered to be potentially deleterious on the basis of the results of any of the algorithms used, suggesting it is a rare but benign variant. All other missense variants were considered potentially damaging on the basis of at least one measure. To evaluate whether missense variants inhibit the function of the CHEK2 protein, an in vitro kinase activity test based on a CHEK2-specific substrate peptide carrying a C-terminal SOX was developed . Overexpression of recombinant CHEK2 at high levels in bacteria is associated with CHEK2 autophosphorylation and activation in the absence of DNA damage . This property was used to obtain recombinant activated CHEK2. Upon the phosphorylation of the SOX-specific substrate by CHEK2, the presence of the chemosensor SOX results in an increase in fluorescence at 485 nm. Activity was detected for the WT protein but not for proteins extracted from nontransformed bacteria or recombinant CHEK2 protein carrying c.1100delC (Figure 2). Only missense variants were tested for kinase activity. c.190G > T (Glu64X), c.825_826del, c.846+4_+7del and c.792+1dup were considered deleterious without further analysis. Four mutations tested for kinase activity in vitro by Sodha et al. were included to validate the assay. Kinase activity of recombinant Flag-CHEK2 protein. Total protein extract (1.5 μg) was tested for the ability to phosphorylate a fluorescent substrate. The slope of the resulting curve represents Flag-CHEK2 kinase activity. The slope of the wild-type (WT) Flag-CHEK2 kinase activity curve was normalized to 1. Nontransformed protein extracts (NT) and mutant c.1100delC served as controls. Each point represents an average of five measurements performed in triplicate. Three different classes of kinase activity were observed: WT-like, intermediate and null (Figure 2). 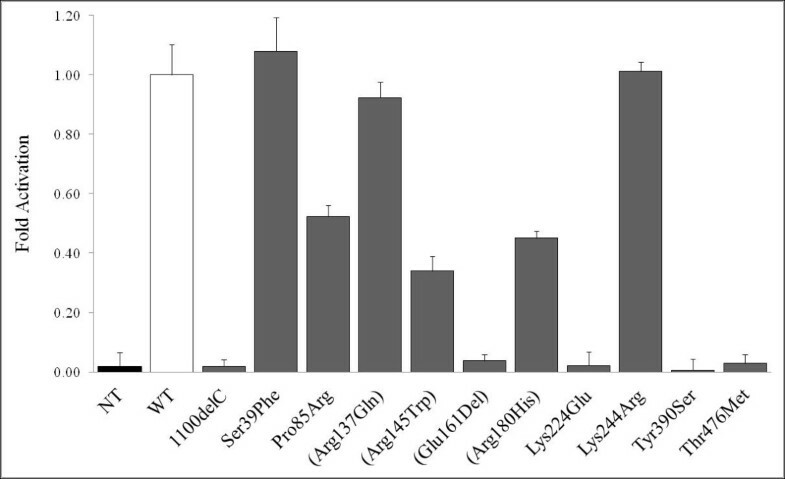 Mutations Ser39Phe, Arg145Trp and Arg137Gln exhibited WT-like kinase activity, suggesting that these mutations do not affect the ability of recombinant CHEK2 to recognize, bind and phosphorylate its substrate (Figure 2). The mutants Pro85Arg, Arg180His and Lys244Arg had significantly lower, but not null, kinase activity (Figure 2), which placed them in the intermediate class. The mutations Glu161Del, Lys224Glu, Thr476Met and Tyr380Ser did not have any kinase activity. Nine of the eleven mutations showed kinase activity consistent with the in silico analysis, demonstrating the good but incomplete correlation of those two approaches (Table 3). Both in silico and in vitro analyses suggested that the variant Lys244Arg, present in cases and controls, can be considered benign. This variant was thus removed from the pool of potentially deleterious CHEK2 variants that contribute to HBC. As a result, the mutation frequency was reduced to 1.48% for cases and 0.29% for controls (Table 2). This difference remained significant (P = 0.0042), and the OR associated with the presence of a deleterious mutation was increased to 5.18 (95% CI: 1.49 to 18.00). We found strong evidence of an association between CHEK2 variants and HBC, with an OR of 5.18. Of 16 different mutations, 9 were unreferenced variants. This demonstrates that, in populations without founder mutations, an aggregate of rare variants makes CHEK2 an appreciable breast cancer risk gene. The functional consequences of missense variants can be difficult to establish, and in estimating associated risks it is important to separate deleterious from neutral variants. We were unfortunately unable to complement the functional data presented here with a study of the cosegregation of these variants with cancer, because only the index case was available for analysis in the majority of families. Missense variant Ser39Phe was predicted as probably deleterious by two of the three scores (SIFT and Align-GVGD), but exhibited WT-like kinase activity. This discordance may suggest that not all deleterious changes in the CHEK2 protein can be revealed by the in vitro kinase activity test, most notably for changes outside the catalytic domain. Changes affecting interactions with upstream activators such as ATM, for example, may not be detectable by our measure. In contrast, Lys224Glu was predicted to be a tolerable change by the three scores, but exhibited null kinase activity, demonstrating the complementarity of those two approaches. Further functional tests, such as expression in eukaryotic cells, followed by measures of activation by DNA strand breaks, protein stability and interaction with cellular partners may be necessary to appreciate all effects of these mutations, especially for those where the in silico and in vitro conclusions differ. We thus retain this variant as potentially deleterious, unlike Lys244Arg, which was characterized as benign by all measures. The association between the CHEK2 gene and breast cancer risk has been supported mainly by case-control studies of founder mutations such as 1100delC, I157T (frequent in northern and eastern Europe) or the Polish founder mutation IVS2+1 G > A (c.444+1G > A) [19, 20, 24, 43, 44]. In our population, only one of these founder mutations was observed, accounting for one-third of deleterious mutations. Analysis of the entire coding sequence was necessary to capture the majority of the different mutations present. This might be the case for other populations where the frequency of the CHEK2 founder mutations is low. In Table 4, to give an overview of CHEK2 contribution to breast cancer, we summarize the results of 36 different case-control studies from different countries where the presence of variants was assessed by allele-specific sequencing or DNA sequencing of the entire gene. The ORs of breast cancer from the different studies of c.1100delC are similar, regardless of the selection of cases, with a combined OR of 2.77. We also found comparable results for the other protein-truncating mutation c.444+1G > A, which is less frequent but has an OR similar to that for c.1100delC. No positive association with HBC was observed, possible due to the very low frequency of the variant in both cases and controls. The frequent variant I157T was associated with lower ORs than null mutations. Although this variant has been associated with breast cancer risk in early-onset or unselected cases, in our study it did not exhibit a significant association with HBC. Although the frequency of these deleterious mutations was different among populations, the ORs associated with breast cancer were consistent for the two null mutations and lower for the missense mutation. These data were collected using allele-specific sequencing, suggesting that testing for CHEK2 founder mutations is cost-effective in some populations because the variants are sufficiently common and the test is relatively inexpensive. Consequently, however, these techniques exclude mutations present elsewhere in the gene. BBC = bilateral breast cancer; EOBC = early-onset breast cancer; HBC = hereditary breast cancer not related to a BRCA mutation; UBC = unselected breast cancer; AJ = Ashkenazi Jewish; AUS = Australia; B = Belgium; BY = Belarus; CDN = Canada; CZ = Czech Republic; D = Germany; DK = Denmark; E = Spain; F = France; FIN = Finland; IRL = Ireland; KP = South Korea; NL = The Netherlands; PL = Poland; RUS = Russia; S = Sweden; UK = United Kingdom; USA = United States of America; NS = nonsignificant (P < 0.05); **P < 0.0001. Participant numbers may vary from original publications because of exclusion of study subgroups. Because the c.1100delC allele does not seem to be present in southern Europeans or in most non-Caucasian populations [45–47], other research groups have used full-gene sequencing to determine whether other variants contribute to breast cancer risk. There is a positive association between CHEK2 variants and HBC in the Australian, Canadian, North American, German and now French, but not Czech Republic, populations [22–25]. This suggests that CHEK2 analysis in populations where the common founder mutations are rare requires screening of the entire sequence. Narod's  recent review supports the view that testing non-BRCA HBC families for mutations in CHEK2 can provide useful information to evaluate the risk of breast cancer and suggests that the relatively high cost of sequencing makes only the targeted search of frequent mutations cost-effective. In certain populations, one or a few mutations do indeed capture the majority of CHEK2 variants associated with cancer risk. In most regions, however, this allele-specific approach is inadequate and a full-resequencing strategy should be considered. The rapidly falling cost of resequencing, as well as alternate techniques, should make this possible. The usefulness of the information gained from genetic analysis of CHEK2 is currently a matter of debate. As we have discussed, the risk of breast cancer for a woman with a null mutation in this gene is increased two- to fivefold. Increased breast surveillance may be proposed for carriers, but when counseling a family with many breast cancer cases, only some of whom carry the CHEK2 mutation, it is unclear what advice may be given to noncarriers. Collecting research information on CHEK2 mutations, however, serves to advance our understanding of the contribution of this gene to hereditary cancer risk. We thank Molecular Genetic Diagnosis team and Dr Bernard-Gallon's team for technical assistance. The Ligue Contre le Cancer d'Auvergne provided financial support. A. Desrichard was funded by grants from the Conseil Regional d'Auvergne and FEDER. AD contributed to the sequencing of CHEK2, designed and performed the kinase activity, participated in the in silico analyses and drafted the manuscript. YB provided expert technical advice, and helped to draft the manuscript. NU designed the study, participated in the sequencing of CHEK2 and provided expertise for the in silico analyses. YJB supervised the study and helped to draft the manuscript. All authors read and approved the final manuscript.